Glynn Isaac writing notes at his field desk. Natron (Peninj), Tanzania, 1982. Glynn Isaac was one of the leading figures in palaeoanthropology, one who specialized in Palaeolithic archaeology and the origins of human technology. He is perhaps best remembered for his research at the Acheulean localities of Olorgesailie in southern Kenya and Peninj (Lake Natron) in northern Tanzania, and especially at the Early Stone Age sites at Koobi Fora (East Turkana) in northern Kenya. Glynn was also well-known for his incisive intellect and for his seminal articles on the technology, behavior, and diet of early tool-using hominins. He was a strong proponent of hypothesis testing, taphonomic studies as well as actualistic studies such as ethnoarchaeology, primatology, experimental archaeology, and he was a pioneer of landscape archaeology, which he dubbed “the scatter between the patches.” He favored a perspective on early hominin behavior that included home-bases (central foraging) and food-sharing behavior. Glynn was born in Capetown, South Africa, the son of two botanists, whom he credited with his interest in natural history. His father was Professor of Botany at the University of Capetown, and his identical twin brother, Rhys, was a Pulitzer Prize-winning historian focusing on American colonial history. Glynn was schooled in Capetown, and received his B. Sc. in Geology (for which he received the Class Medal in 1956). He also received his B. Sc. in Zoology (for which he received the Class Medal in 1957) and Archaeology/Ethnology at the University of Capetown in 1958, where he studied with Monica Wilson and John Goodwin. Glynn read Part II of the Archaeological and Anthropological Tripos. One indication of Glynn’s tenacity and passion for the field can be seen in 1956 when he hitchhiked 1,000 miles from Capetown up to Livingstone (then Northern Rhodesia) to study collections from the Zambezi Valley in the vicinity of Victoria Falls. He went on to Cambridge University as a member of Peterhouse on a scholarship and received his B.A. in 1961, studying with such luminaries as Grahame Clark and Charles McBurney. The scholarship he received at Cambridge was an Elsie Ballot - for South African students, the Cambridge equivalent of a Rhodes which is only for Oxford. In 1960, at a Derbyshire Archaeological Society Dig led by Charles McBurney at Creswell Crags, Glynn met his future wife, Barbara, who has a B.A. in English from Cambridge, and would collaborate with him on his research projects throughout his career. They had two daughters, Gweneira (now on the Anthropology faculty of Arizona State University), and Ceri (now a specialist in digital textile design). In 1961 he was appointed Warden of Prehistoric Sites in Kenya by Louis Leakey, and was promoted to Deputy Director of the Center for Prehistory and Palaeontology at the National Museums of Kenya two years later. He had a close relationship with Louis and Mary Leakey, and subsequently with their son, Richard Leakey. He was invited by the Leakey’s to continue research at the Olorgesailie in Kenya, which became his doctoral dissertation topic. He received his PhD from Cambridge University in 1969. Glynn Isaac joined the faculty of the Anthropology Department at the University of California, Berkeley in 1966, joining such distinguished prehistorians as J. Desmond Clark, and later joined by F. Clark Howell. Other important Berkeley colleagues during this period included Richard Hay and Garniss Curtis in Geology, William Clemens and Don Savage in Palaeontology, Roger Byrne in Geography, and Thelma Rowell in Biology. In his seventeen years in Berkeley, Glynn and Desmond Clark built up one of the strongest programs in African prehistory and palaeolithic archaeology in the country, emphasizing a behavioral approach to the archaeology of human origins. In 1983 Glynn and his family moved to Cambridge, Massachusetts to become the first George Grant McCurdy Chair of Palaeolithic Archaeology at Harvard University, and began building an impressive research program and laboratory there until his very untimely death in Japan in the fall of 1985 at the age of 47. 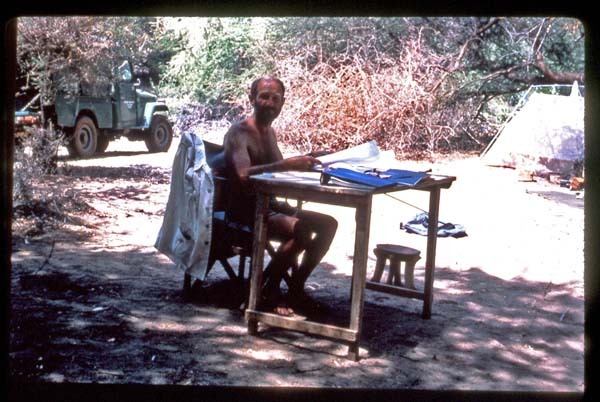 His publications included Olorgesailie: Archaeological Studies of a Middle Pleistocene Lake Basin in Kenya (1977); After the Australopithecines (1975) edited with Karl Butzer); Earliest Man and Environments in the Lake Rudolf Basin (1976) edited with Yves Coppens, F. Clark Howell, and Richard Leakey); Human Origins: Louis Leakey and the East African Evidence (1976, edited with Elizabeth McCown); Human Ancestors: Readings from Scientific American (1979, edited with Richard Leakey); and, posthumously, Koobi Fora Research Project, Volume 5: Plio-Pleistocene Archaeology (1997). Barbara Isaac edited a collection of eighteen of Glynn’s most important scholarly papers in the book The Archaeology of Human Origins: Papers by Glynn Isaac (1989). “The goals of archaeology have been well defined over the past century and will require little change. Archaeology ought to be what archaeology already is. The problem is how we can improve our ways of doing it? This is a challenge that every generation faces afresh”. Glynn enthusiastically embraced new methodological and theoretical approaches, including quantitative analysis of prehistoric data, new radiometric techniques of dating sites, volcanic tuff correlations between prehistoric localities, stable isotope analysis, geoarchaeological and site formation studies, and optimal foraging theory. He always encouraged students and colleagues to “think outside the box” and explore new approaches to understanding the prehistoric past. Glynn was the principal graduate advisor to both Kathy Schick and Nick Toth of the Stone Age Institute, and was involved in the training of a host of other scholars, including Stanley Ambrose, John Barthelme, Rob Blumenschine, Steve Brandt, Henry Bunn, Thure Cerling, Diana Crader, Diane Gifford-Gonzalez, Jack Fisher, Joanne Guten, Jack Harris, Ingrid Herbich, Yusuf Juwayeyi, Zefe Kaufulu, Ellen Kroll, Hiro Kurashina, Curtis Marean, Harry Merrick, Francis Musonda, Karla Savage, Jeanne Sept, Ann Stahl, Dan Stiles, Nicola Stern, Paola Villa, and Annie Vincent. Glynn is remembered by all who knew him for his sharp intellect, his stimulating classes and seminars as well as public lectures, his seemingly inexhaustible energy both in the field and on campus, his gregarious nature, and his keen sense of humor. We personally have fond memories of working in the field with Glynn in Kenya and Tanzania, our annual departmental “oyster-fest” on the Pacific coast with Glynn and Desmond, field archery with Glynn in Briones Park in the Bay area, and the wonderful receptions and dinners that Glynn and Barbara would host at their homes. It was an honor and pleasure to know and work with Glynn, and he made an indelible impression on us and on prehistoric research. Glynn Isaac leading a tour. Koobi Fora, Kenya, 1978. Glynn and local assistant analyzing a dead elephant at Peninj (Lake Natron). Northern Tanzania, 1982. Glynn and Barbara with daughters Gweneira and Ceri. Drake's Bay, California, 1967. Glynn at an excavation site. Koobi Fora, Kenya, 1978. Glynn taking notes. Koobi Fora (East Turkana), Kenya, 1978.